Neeson reads the Introduction and prayers for each of the 14 Stations of the Cross written by St. Alphonsus Maria Liguori. The 18th-century Italian saint is a doctor of the Church and founded the Redemptorists. This groundbreaking production will change forever the face of Catholic music. It combines the unmistakable voice of Liam Neeson, one of the world s finest actors with the glorious hymns and prayers of St. Alphonsus Liguori, one of the Church s greatest saints. Music heard for the very first time performed and sung by the world's best musicians and singers. And the company behind this masterpiece is Little Lamb Music, co-founded by Ray Herrmann, a Grammy award-winning musician and one of the world s finest instrumentalists. He has spent the last 20 years playing, composing and arranging music for some of the biggest names in American music: Chicago, Bob Dylan, Santana, LeAnn Rimes, Stevie Wonder, George Benson and Herbie Hancock, to name a few. Ray is also a member of the house band on the hit television show, American Idol. 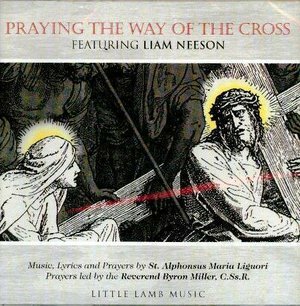 Praying the Way of the Cross featuring Liam Neeson CD takes the art form of devotional music to new heights. It has set a new standard for sacred Catholic music for many years to come.